Keeping your home comfortable (and your energy bills affordable!) starts with the perfect thermostat for you. Improving your energy efficiency isn’t easy, but it can be aided with the right thermostat. Keeping your home comfortable (and your energy bills affordable!) starts with the perfect thermostat for you. What types of thermostats are on the market, and how can they help your home be as energy efficient as possible? Manual: These thermostats are more old-school, but they still get the job done. Manual thermostats work by moving the needle up and down to set the room at the temperature of your choosing. They don’t have many confusing controls but instead work to cool or heat your home to the temperature you placed the needle at. Manual thermostats are not the best at energy saving, because they have to be adjusted by hand. Programmable: Programmable thermostats allow homeowners to set a schedule so that the heat or air conditioning will automatically kick on when it is not the programmed temperature. You can have your unit kick off while you sleep or adjust things for a weekend away. Programmable thermostats are great for saving some energy and still staying comfortable. Smart: Smart thermostats are the hottest way to make your home more energy efficient and more comfortable. These use the Wi-Fi in your home to sync with an app. You can change the temperature from the app, wherever you are in the world. Smart thermostats also learn your behavior, so they can automatically adjust based on what you typically do. What Matters When Choosing a Thermostat? 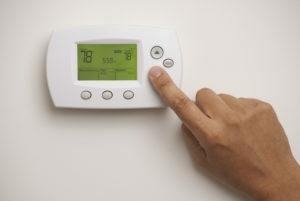 Is the thermostat compatible with your HVAC system? Depending on the type of unit you have and the power source, certain types of thermostats might not be an option. If you aren’t sure whether or not your thermostat is compatible, talking with an HVAC specialist. How Much Energy Can a Thermostat Save? Thermostats can only save you as much energy as you are willing to! That means that no thermostat can magically reduce the energy you use if you still choose to blast the air conditioner in the summer and crank the heat all winter. Instead, you must be willing to sacrifice a few degrees of comfort to reap energy savings. On average, smart thermostats save 10-12% on heating and 15% on cooling in a year. This entry was posted on Thursday, August 9th, 2018 at 11:49 am. Both comments and pings are currently closed.